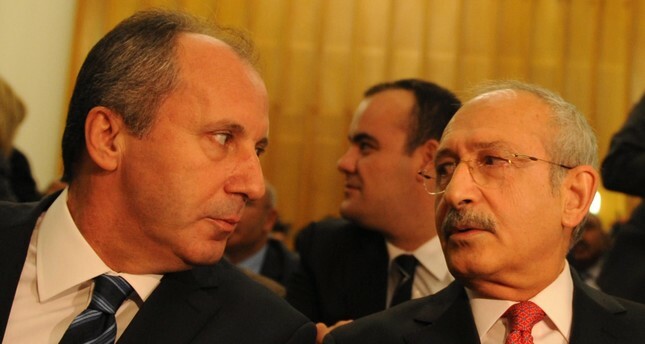 The poor results in the June 24 elections inflamed a bitter feud within the CHP administration, with the party’s presidential candidate Muharrem İnce openly challenging current party Chairman Kemal Kılıçdaroğlu. Frustration among the members of the main opposition Republican People's Party (CHP) continued over the weekend as the party's provincial head in Afyonkarahisar, Savaş Erdoğan, and several members of the province's executive board announced their resignations. The group explained that they reached this decision because they presented a stance for change within the party but their demands were ignored. Referring to the previous statements calling for an urgent rejuvenation with an extraordinary convention to ignite a new process, Savaş Erdoğan stated that "the process of collecting signatures and the following incidents as well as the attitude of the headquarters did nothing else than wear out our party." He added that party administration used "five or 10 signatures as an excuse to not convene the convention despite the apparent problems within the party." The results of the June 24 presidential and parliamentary elections inflamed a bitter feud over the leadership within the CHP administration. The CHP's presidential candidate Muharrem İnce, who received 30 percent of the votes, openly challenged the current party Chairman Kemal Kılıçdaroğlu for the chairmanship and proceeded to offer him a position as honorary chairman. Since İnce made no secret of his intentions for change within the CHP, deputies supporting him moved to submit signatures to hold an extraordinary convention and eventually elect İnce as the new chairman. Yet, their efforts were rejected as the headquarters announced that there would not be an extraordinary convention. Savaş Erdoğan added that they took the decision to resign as the 2019 local elections approach and it would be better to pave the way for a new team that might work with the headquarters in harmony. The June 24 elections saw the People's Alliance, which was formed by the Justice and Development Party (AK Party) and the Nationalist Movement Party (MHP), claim victory with 53.7 percent of the votes and President Recep Tayyip Erdoğan with 52.6 percent. On the other hand, the CHP and the Nation Alliance, which was formed between the CHP, the Good Party (İP), the Felicity Party (SP) and the Democrat Party (DP), garnered 33.9 percent votes. The CHP, as one party, only managed 22.6 percent, which is statistically lower when compared to previous elections.